Let me first start off by saying that I am an equal opportunity yarn user. I strongly believe in giving ever yarn a chance. There is no such thing to me as ‘bad’ yarn. With that being said, I find offense in those who persist in putting down acrylic yarns. I can understand personal preferences for one yarn type over the other, put to dismiss acrylic to the point of wanting to excommunicate it from the church of yarn is just going to far. Acrylic has had a history of being hard and stiff, but no more so then wool being equated with smelly and itchy. Yet, like wool, acrylic has improved in quality over the years. Please, before you turn up your nose at this step-child of the knitting and crochet world, why not allow me to enlighten you on why you should take a second look at acrylic. Considered ’cheap’ yarn, by many, I believe its low coast is one of the things that makes acrylic so popular. Personally speaking, I find it hard to pay $35.00 for a skein of yarn- even if it is made of cashmere, handspun and hand dyed. For many crafters, especially just starting out, it is difficult to justify spending large amounts of money like that. Acrylic gives you that chance to make something beautiful with little financial investment. And most people can agree that seeing a sweater you tried to knit turn into a multi-armed glob feels less heart-wrenching having paid $8.50 for the yarn then if you had dished out $85.00 for it. A professional chameleon, acrylic can be whatever you want it to be. Praised for its properties that are so similar to that of wool, acrylic has the ability to mimic such yarns as the highly revered cashmere. Pashmina and cashmina are the acrylic versions. (Yes, those are acrylics, not cashmere from some other exotic breed of goat.) Fun fur and eyelash can give credit to acrylic for making them a fashion craze. And lets not forget how acrylic brought the words ’novelty yarns’ into the vocabulary of every crafter with such offerings as Chenille and Lame. An acrylic yarn I recently worked with has the look and feel of handspun felted wool. From super bulky to spider web lace- acrylic yarn’s versatility is endless. Within acrylic’s durability lies its greatest strength. How many yarns can hold up to multiple machine washings in various water temperatures? Show me a yarn that can withstand the constant pull and strain from the tight tension of new knitters just learning to knit and purl. Give me a yarn that has been able to stand up to continuous household wear and abuse. 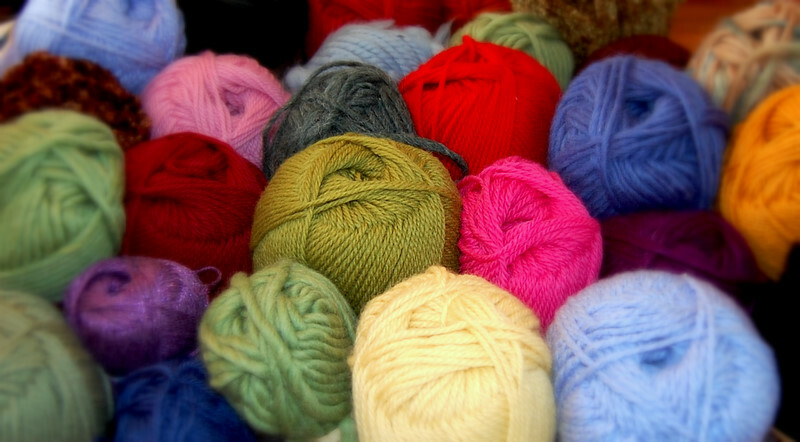 I don’t believe we have ever asked any other yarn to work as a kitchen accessory, outdoor rug, sweater, purse, slipper, coat, toy, bathroom accessory, sock, rag, table runner, bedspread, baby blanket and various other items- while expecting it to perform to the same high standard in each area. Acrylic is resistant to moths, oil, chemicals and is very resistant to deterioration from being exposed to sunlight. This is why, like Twinkies and cockroaches, acrylic will be around long after we are gone. Now, here is where I usually hear from people about the fact that acrylic is man made and the chemicals used to make it is poisoning our waters, polluting our air, threatening our eco system and sending our world into utter self destruction. Yes, acrylic is a man made chemical based product. But compared to how many items currently in every home, school and hospital around the world that is made from and/or depends on acrylic, its yarn form is in no way making that big of a carbon footprint on our world. So, before you dismiss acrylic yarn as some dark shameful part of needlecraft history that should never be spoken of again, entertain me with this little experiment. Go to your local yarn store, pick up a soft yarn like Lion Brand Homespun, cast on and see if acrylic doesn’t stitch its way back into a respectable place in your heart. I finally finished the Toorie hat that’s been taking up my size #7 needles for far too long. It was a slow process making the hat as I worked purely from the pictures posted from other people who had made the hat. Yes, you heard right. I don NOT use a pattern to make this hat. I studied the pictures and figured it out myself. No, I wasn’t being cheap, trying to avoid paying the designer for her pattern. I wanted to test myself to see how well I could do in copying a design. Looking at the final product, I must admit that I did pretty well. There are some differences between mine and the actual design- especially in the side decreases. This project turned out to be an interesting challenge to test my skills as a knitter and to help me better understand garment construction in knitting designs. Have you ever looked at a knitted item and made one like it without ever looking at a pattern? Please do share! Nothing can relieve the stress of the day like winding a skein of yarn into a yarn ball. Does yarn have any level of self-esteem? Does it like being in cliques or prefer to be a loner? Does yarn recognize its own self worth? These are questions I pondered as I took a look at my yarn the other day. My yarn isn’t bad yarn. It’s actually a very nice color. And it knits very smoothly for the garment I am currently using it for. There have been no conflicts between my yarn and my needles. In fact I would say they’ve become very good friends since the beginning of the project. Even despite not checking gauge, this yarn has adapted itself to fulfilling the required rows and stitches needed for the pattern. Overall, I would call it the perfect yarn. So, why is it that the other day at my knitting group, my yarn refused to come out the bag? No matter how many times I tried to hold my yarn out in the open, it found some way to go into hiding. If I placed it on the table it would roll back into the bag. On my lap it would find a way to scoot itself onto the floor and into the darkest corner available. It’s not like it has never been outside before. I’ve draged yarn with me all over the US. My yarns can tell stories of where its been and hopes t go next. I just couldn’t understand way my normally social yarn was shirking away like a wallflower. I looked around the knitting table and saw that everyone else’s yarn was behaving nicely, sitting on the table like good little yarn balls. But then I noticed it. I don’t know why I hadn’t seen it before. To my left was a lovely 100% baby merino wool yarn ball in variegated shades of pink and purple. To my right was an chocolate brown hand dyed silk nestled in its owner’s lap like a sleeping infant. Across from me was an organic cotton flowing from a dainty handmade knitting ball purse. Each and every woman sitting around me were happily knitting away complex patterns with natural fibers and exotic blends. Then there was my yarn. Not that my yarn wasn’t capable of a complex pattern. It was that it didn’t fit in with the crowd I was now trying convince it to join. My yarn, despite its beauty and comfort, was the odd man out. My yarn was acrylic. Man made. Un-natural. Fake. I could now understand its desire to stay out of sight. Now as most people would think, “What’s wrong with acrylic? 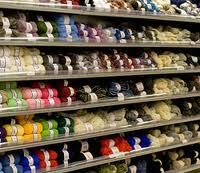 Isn’t all yarn the same?” This is an approved statement coming from any non-knitter. But in the world of knitting, comparing natural fibers to man made yarns is like comparing fish to watermelons. And for one lonely acrylic being a room full of naturals it would be comparable to the school nerd walking in on a party that he wasn’t suppose to be invited to. Awkward. So, my yarn felt a bit uncomfortable not seeing any of its own kind. It may have even felt a bit unworthy to be in the presence of such natural giants. But I really like my yarn and have found myself working at building its confidence level up and letting my yarn know that it is beautiful, no matter how it came into this world.